Gabe can be seen from the rear of the stage, performing before a standing room only, capacity crowd during FPB's third set of the 2009 New York State Fair in Syracuse, NY on September 1st. FPB played before a standing room only crowd during each of their three sets! Fritz presents a Jagermeister stretchy shirt to Sharron Pearson just before FPB's third set of September 1st at the New York State Fair. Sharron booked FPB for the 2009 New York State Fair(Thanks Sharron!!!). Frank, Gabe (hidden), Rick, Tom, and Fritz toast some Jager with Ron (L) and Allison (R) after FPB's second set of the 2009 New York State Fair. Fritz and Frank present Mary with a Jagermeister stretchy shirt after FPB's second set of the 2009 New York State Fair. Fritz, Rick, and Gabe are shown here on September 1, 2009 at the New York State Fair in Syracuse, NY during FPB's second set of the day. Tom, Frank, Fritz, and Gabe are shown here during FPB's first set of September 1st at the New York State Fair. Frank, Fritz, and Rick tear through a tune in Old Forge, NY on August 30th. Gabe is shown here during FPB's gig on August 30, 2009 in Old Forge, NY. Fritz, Frank, Gabe, and Rick meet one of their fans, John, before their first set of August 30th in Old Forge, NY. 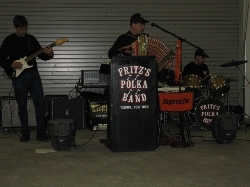 The guys in Fritz's Polka Band are shown here on August 29, 2009 in Monticello, NY with their friends (and accordionists), Frank Moravcik (L) and Steve Kucenski (R). During the evening of August 28, 2009 in Monticello, NY, Rick, Tom, and Fritz along with a couple of friends have a Jager toast in honor of FPB member, Fred Scherz Sr., who's bravely fighting cancer. Tom gets the audience clapping along to FPB's rendition of 'Old Time Rock And Roll' during FPB's evening gig of August 28th in Monticello, NY. Rick is pictured here during FPB's evening gig of August 28th at Kutsher's Resort as part of Adam Barthalt's Polka Fest Weekend. Frank and his Fender during FPB's evening gig of August 28,2009 in Monticello, NY at Kutsher's Resort. Gabe is shown here during FPB's evening gig of August 28th in Monticello, NY.